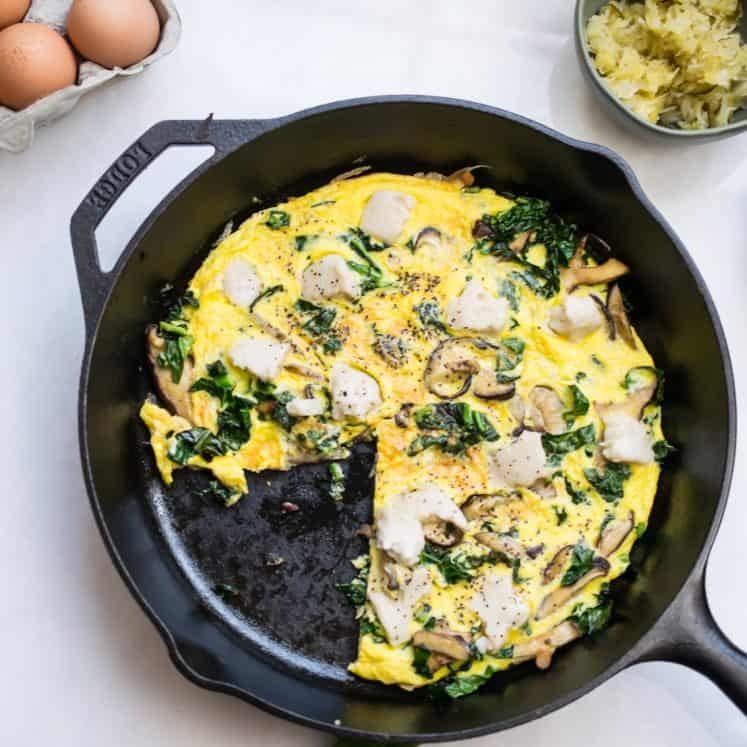 Quick Cooking Frittata with Mushrooms, Kale and "Cheese"Quick Cooking Frittata with Mushrooms, Kale and "Cheese"
A thin and quick cooking mushroom and kale frittata with dairy free cheese! Heat a 12″ skillet over medium heat and let it come to temperature while you prepare the vegetables. Melt 1 tablespoon of fat in the skillet and add in the mushrooms. Saute for 6-8 minutes until fully cooked and tender. Add in the garlic and kale. Saute for 3-4 until the kale is tender. Add the remaining fat to the skillet and use a spatula to spread it around while you evenly distribute the vegetables in one even layer on the skillet. Whisk the milk into the eggs with the salt and pepper. Then pour it evenly into the skillet. Cook here until the edges begin to look cooked. TIP: If using cast iron, periodically rotate the skillet on the stove so it cooks evenly. Once the edges of the eggs look done, but the rest is still fluid, put the skillet in the oven, top rack and set the broiler to 500F. Broil for 90 seconds – 2 minutes until fully cooked. Remove from the oven, use a knife to cut 4 slices and serve. 2 slices per person! Enjoy! Macros below are calculated using Miyokos Vegan Mozz cheese and Elmhurst unsweetened cashew milk.